In November, I featured some of the fabulous urban street art in the Soho district of Málaga – which proved to be a very popular post! Since then, more murals have been commissioned by the city, including these two on the facade of the Colegio García Lorca. 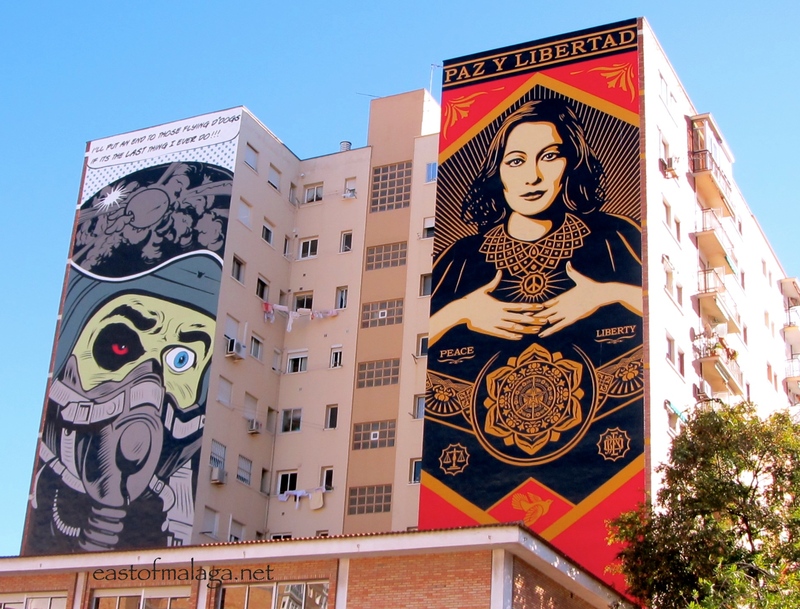 The one the left is by British street artist D*Face whilst the other, (Peace and Liberty) comes from American contemporary street artist, Shepard Fairey (aka OBEY). There’s great street art in many cities around the world, so please share some with us in this month’s CBBH Photo Challenge: STREET ART. Casa Az provides an online scrapbook of daily events in the life the Queen of Tapas! Canadian by birth, Shawn is a cancer survivor now living with her little friends in the Andalucían capital of Seville, where she conducts tapas tours for visitors to the city. Caroline Angus Baker is a self-professed Duende-loving Kiwi novelist, commentator on modern and historical Spain and Spanish Civil War nerd, full of bullfighting praise. She’s had a busy 2013, too! I’d love to you pop along and say HOLA to both of these ladies. Tell them Marianne sent you! 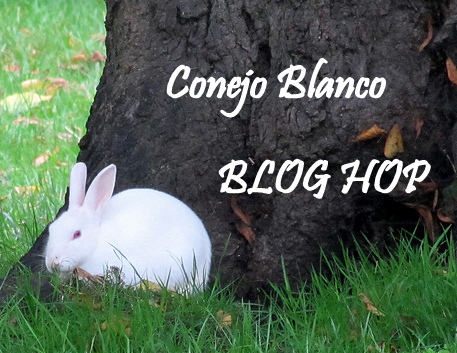 So that´s the CBBH Photo Challenge for January, everyone! This entry was tagged Andalucía, CBBH, CBBH Photo Challenge, East of Malaga, Europe, life, Malaga, photography, Seville, Spain, Tapas, travel. Bookmark the permalink. Could you tell me where I can locate a few more hours in the day so I can keep on top of the many posts I’ve missed? weeks Weekly challenge as one of my photo was a selfie of an artist at this Street Art festival. Thank you for hosting CCBH. I always enjoy the entries when I’m able to visit the other bloggers. I hope to visit some in the next few days. Ah – a few more hours in the day?? Hmmmm … think we could all do with some of those sometimes, Issy! I’m so glad you joined in with my Street Art Challenge – and it merged perfectly with this week’s WPC, by Cherie – didn’t it? Love the children’s chalk art – AMAZING!! Phew…three days to go and I made it. Absolutely lovely, Jo. It had slipped my mind that Katikati is the world capital of street art! Isn’t Ken Rockwell’s site amazing? I knew you would love it. I do. Thanks so much for pointing me in his direction. I love popping in to try out things that are new. I am not sure if that one was up when you were here, but it is one of my favourite ones now in the town. I think so Marianne. They had an art festival recently and added some new ones. I will have to get my act together and go take some pictures. Here is my contribution – a little selection of London street art by Phlegm. Hi Debbie – I added the link to your post BTW – I think you must have forgotten to add it! No matter. Thanks for sharing your two links – they are great photographers. Thanks, Marianne. I enjoyed seeing the vast array of street art in Spain from other CBBHers too. I’m in the process of interviewing some local street artists, but I doubt that will be ready for a blog post in time for this challenge. Still, glad to see you all turning a spot light on these artists’ work. I’ll be following the posts with great interest. Yes, I came across your post via Lucy, the other day. Right. I’m actually going to take part this month. Brace yourself!! OK, it took me awhile but mine is up at http://emiliopasquale.wordpress.com/2014/01/06/cbbh-photo-challenge-street-art/. ! can not wait to see what others have found in their cities. I’m not sure all have been painted over. Maybe half were. Maybe now the other half are. well funny you say that, because I could well be there in May! I love those two so much – the only sad thing is that they were supposed to be painted on the same days, but owing to high winds hitting the left building, “D*Face” was not able to start on the same day so there was about 48 hours between them being completed. It was still fascinating to watch them on a daily basis though! It was amazing – needed a head for heights I can tell you!! I can believe that, Michael! Thanks so much for the mention and the linkage. I’ve actually got a Málaga street art blog post in the works but am way behind on things. Perhaps I’ll have some extra time this month to catch up. Feliz Año! You’re welcome – I know how much you love your visits to Málaga, Shawn. Very best of wishes to you for 2014. Yes indeed – very commendable street art, Gilly. Yes I agree, it is difficult to imagine – and it only took about three days I believe! I love street art especially good street art! Happy New Year! All the best for 2014 to you and your family. That is an incredible street art, Marianne! Hope your 2014 is everything you wish for yourself. Amazing, great art and capture! Happy new year, Ron. Happy New Year Ioanna. How are you? Haven’t seen you around for a while. Is Shepard Fairey his real name?!? !